a group of companies with complete plumbing solutions. We're a group of experienced and innovative manufacturers with vast product range to offer. WATERFLO a name synonymous with quality, innovation and service is trend setters in plastic piping system in India. Company's objective is to meet the growing needs of the customers in water management and housing sector through specially developed high performance piping range. WATERFLO has no doubt, brought about a revolution in the Indian plastic pipe industry. 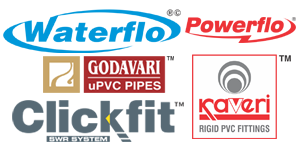 GODAVARI GROUP consists of three companies named KAVERI POLYMERS PVT. LTD., GODAVARI PIPES PVT. LTD. & WATERFLO PIPING SYSTEM promoted by dedicated Tilva Family under the dynamic leadership of Mr. H. M. Tilva.